The Belkin F1DC116B-SR is a 17" LCD Rack Console with built-in 16-Port PRO3 KVM Switch which enables secure and compact centralized server control. The KVM Switch features dual-port cabling, with cross-platform support for PS/2 and USB servers. 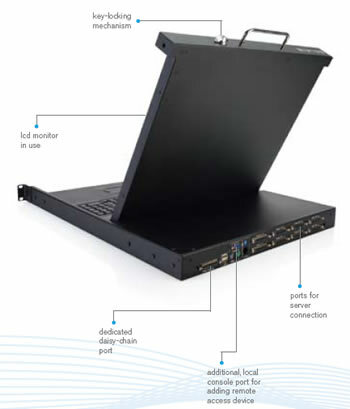 With its slim 1U design, the Rack Console fits a standard 19-inch rack and works with any server. Note: One cable is required for every two servers attached to integrated KVM. KVM Cables are sold separately. Question: Any idea where I might find a users guide for a Belkin F1DC116B-SR KVM? I has a used one and need to get past the admin login and I figure the users guide will have instructions for how to reset it to factory defaults. Here is your requested manual for the F1DC116B-SR KVM console. "To reset the admin password on a Pro 3 KVM, look on the underside of the unit. There is a small hole through which you can see two (2) contact points on the printed circuit board. Using a piece of wire, connect these two (2) points while the KVM is switched ON. It will beep and reset the user settings. Only one (1) user admin with the password belkin (not case-sensitive) will remain, other users will be deleted. NOTE: This does not affect other KVM settings, such as computer names and Hot-Keys."